When it was captured seven miles off Bermuda in 1902, a previously unknown eel-type creature was described as a genuine sea monster in sensational newspaper reports which appeared across America. 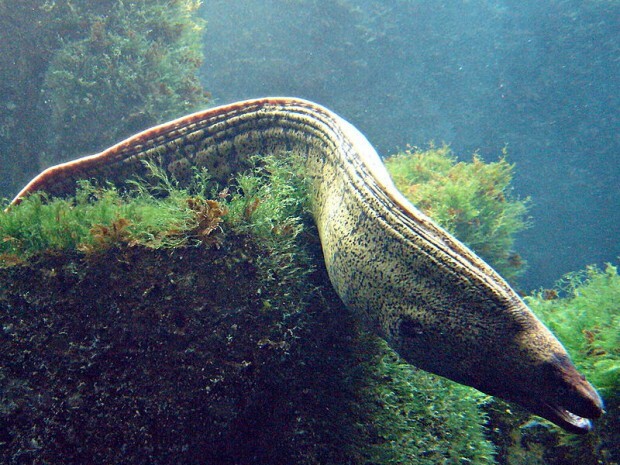 The live six-foot “sea serpent” — described as having “a warlike appearance” [not unlike the moray pictured at left] — was shipped to the New York aquarium so scientists could study it. “In tank number three of the south ground floor of the aquarium, there was deposited there the strangest creature the authorities of that institution have ever been called upon to take care of,” read the “Times” July 2 report. 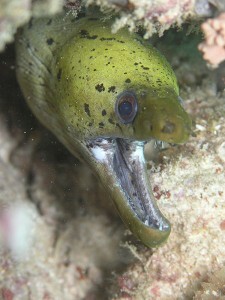 “The creature, which may be a snake or a moray or a deep sea eel or a sea serpent, arrived on the Quebec Line steamship ‘Trinidad’ and was sent north by Professor Charles L, Bristol, Professor of Biology at New York University, who is at present in Bermuda securing rare piscatorial specimens for the aquarium. Professor Bristol was said to be baffled by the unusual specimen. Three “intoxicated Bermuda fishermen” were reported to have captured the creature a few weeks earlier near a ledge where the sea depth abruptly dropped off to 200 fathoms. When the fishermen — “perfectly sober now” — had regained their composure, they put into St. George’s and delivered the creature to renowned Bermudian naturalist Louis Mowbray who kept it alive in a tidal pool. 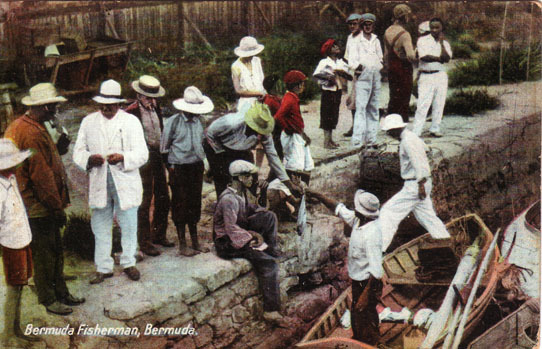 Mr. Mowbray, who built Boston’s aquarium in 1911 and then served as superintendent of New York’s aquarium before becoming founding curator of Bermuda’s aquarium in 1928, passed the specimen on to Professor Bristol for study. The American scientist, a founder of the Bermuda Biological Station for Research [now BIOS], arranged for it to be shipped to New York along with other live specimens he caught in local watersfor that city’s aquarium. Unfortunately, the sea creature was dead within a month of its arrival in New York; its body was preserved in formaldehyde so it could be further researched. More than 30 years later two more specimens were caught off Bermuda and placed on display at the Bermuda Aquarium in Flatts. “There is no question this species is entitled to the name sea serpent,” said Mr. Mowbray at the time. It is not clear if the specimens were ever formally identified. Dr. Ian Walker, current curator at the Bermuda Aquarium, Museum & Zoo, has said the majority of reported sea snakes in the island’s waters are either American eels — which spawn in the Sargasso Sea – or some variations of morays. Wildly embellished reports of unusual sea creatures punctuate Bermuda’s history. In what was likely intended as an April Fool’s Day hoax, an account of a Bermuda sea monster written by a young Benjamin Franklin in 1736 enthralled newspaper readers throughout the 13 American colonies. shame theres no picture provided for the ‘sea serpent’. very interesting article though. I especially love it when other countries back in the 18th Centuries and around then mention Bermuda as did Ben Franklin in his writings.